All our beds and headboards are handmade at our workshops in Lancashire with the tailored finish that has become our signature trademark. Each bed can be made as unique as our customers desire an we can create something truly spectacular to suit any request given. We can also create a headboard to suit your own style of bed, visit our headboards here. All designs are handmande to order and no job is too big or too small for us to complete. Our range of beds are expertly hand crafted to suit a variety of bedroom interiors. Contact us today to discuss your requirements. 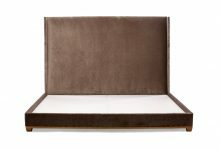 We now offer a brand new range of luxurious and sumptuously comfortable pocket sprung, hand tufted, pure lambswool matresses in a range of standard and bespoke sizes. We have six varieties of matresses, each offering a unique experience, including cashmere, organic cotton, wool with alpaca, silk, mohair, loose curled hair and much, much more. Should you wish to enquire about any of our handmade beds and matresses, please call us on 0207 730 6442 or email london@theoddchaircompany.com. We currently have samples of all six matresses varieties in our London showroom should you wish to explore. You can find us at 45 Pimlico Road, Belgravia, London, SW1W 8NE.